Coffee, alternately touted as medicinal and denounced as health destroying over the centuries, has become one of the most popular drinks in the world today. The Boston Tea Party turned coffee into a patriotic drink in colonial America. In 1952 an ad campaign promoted the idea of a coffee break, and it quickly become a daily ritual in workplaces, homes and churches in the United States. What you get in your cup of coffee varies with how the beans are grown and how you prepare it. Overall, coffee is a good source of the B vitamin riboflavin, and is also a concentrated source of antioxidant phytochemicals. Chlorogenic acid may be slightly lower in decaf coffee according to limited research, but it still contains plenty of phytochemicals. Lab studies suggest that instant may be lower in antioxidant potency than brewed coffee, though more research is needed. Research has shown that certain foods—like coffee—can help fight cancer. But this research takes time…and funding. Help us learn more with your gift now. Your support will help fund the research that could lead to big discoveries in cancer prevention and improve people’s overall health! Coffee contains a variety of phytochemicals, many of which have antioxidant properties. Coffee's possible link to cancer is a well studied one, with over 1,000 studies on the topic. Early in the research, some studies hinted that coffee might increase cancer risk. Larger and more well-designed studies now suggest the opposite: it may be protective for some cancers. Evidence categorized as "probable" means there is strong research showing a causal relationship to cancer – either decreasing or increasing the risk. The research must include quality human studies that meet specific criteria and biological explanations for the findings. A probable judgement is strong enough to justify recommendations; recommendations have not been made about coffee as there are still too many unanswered questions. - There is also limited evidence that coffee may decrease risk of mouth, pharynx, larynx and skin cancers, though more research is needed to determine if these are cause and effect associations. 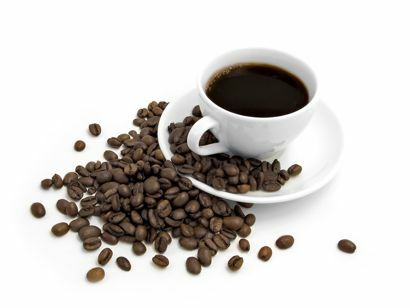 Laboratory studies are focusing on coffee beans' lignans and phytochemicals. In cell and animal studies, scientists have identified several phytochemicals that help control cell growth and reduce cancer cell development. 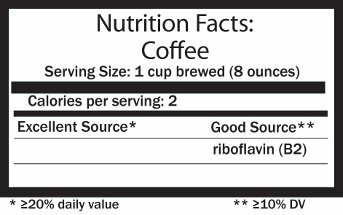 For colorectal cancer, one explanation of why coffee may show protection is its caffeine content. Caffeine may speed carcinogens' passage through the digestive tract, reducing the time our body is exposed to these substances. Cell studies show caffeine influences cell signaling to decrease colorectal cancer development. Chlorogenic acid shows antioxidant activity in lab studies. Caffeic acid seems to serve as an antioxidant and act in several stages of cancer development, helping regulate cell growth, reduce inflammation and increase self-destruction of cancer cells. In cell and animal studies, kahweol and cafestol stimulate enzymes that render carcinogens harmless and block the proteins that activate carcinogens. Coffee is also a source of lignans, compounds that cell culture and animal studies suggest may shift estrogen metabolism, growth factors and regulators of cell growth to reduce cancer cell growth and development and to promote self-destruction of abnormal cells. Population studies typically look at total coffee consumption. Studies that analyzed regular and decaf coffee separately generally find similar results. Relatively large and well-controlled population studies now provide good evidence that up to six cups of coffee per day do not increase the risk of most cancers. Current research even suggests that coffee might decrease risk of certain cancers. In some population studies, people who drink moderate amounts of coffee daily show modestly reduced risk of a wide range of cancers, especially endometrial and liver cancers, although studies show wide individual variation in impact. A 2012 large U.S. population study linked daily coffee consumption with lower overall mortality during the course of the study. When looking at cause-specific deaths, moderate consumption was not linked to cancer-related deaths. There are several hypotheses on how coffee may possibly decrease cancer risk. Coffee is a major source of antioxidants. Limited small intervention studies suggest that coffee may improve markers of antioxidant status and reduce markers of inflammation in the short-term. Animal studies and human studies both suggest that regular and decaffeinated coffee may decrease insulin resistance, a condition that leads to high insulin levels in the body. Reducing insulin resistance could help reduce risk of cancers whose growth is promoted by excess insulin. Roasting time affects coffee beans' color and flavor. Light: coffee will have a higher acidity, some tartness and more of the original bean’s flavor; less “roast” flavor. Medium: sweeter than light roast, but still contains some original bean flavor and aroma. French: beans are becoming a dark brown and appear oily. It is often used for making espresso. Dark (Italian or Dark French): predominant flavors come from roasting; it's smoky and less acidic. Choose the type of grind that's right for your brewing method. Finely ground coffee is best used for espresso drinks. Espresso is brewed very quickly, so the smaller coffee particle size means more of its surface area is exposed to the hot water. This allows for more of the coffee bean contents to be extracted into the water. Medium grind works well for automatic drip coffee makers. 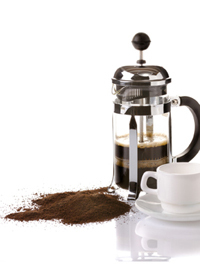 Coarse grind is commonly used for French press pots. Store in an airtight container in a dark spot at room temperature. Air, moisture, heat and light all cause coffee to quickly lose its fresh flavor. For best flavor, use whole beans within two weeks and ground coffee within a few days. Although coffee experts advise against storing coffee in the refrigerator (the high moisture causes coffee's flavor to deteriorate rapidly), you can wrap small amounts in airtight bags and freeze for up to a month. Coffee has a complex flavor; it contains hundreds of aroma compounds, some of which are described as nutty, flowery, chocolate-like and spicy. To extract a good balance of flavors and limit the bitter taste, the ideal brewing temperature is 190-200 degrees F for the water for any type of brew. American drip coffee is the lightest brew and Italian espresso the strongest. Typical proportions of coffee to water (in weight) are 1:15 for American; 1:5 for espresso. Coffee made with a French press, or press pot, retains more flavor, essential oils and the cafestol and kahweol compounds than drip methods. In studies where people drank at least 6 cups daily, this or other unfiltered coffee, such as boiled coffee, seemed to increase blood levels of LDL (low-density-lipoprotein) cholesterol. Coffee itself has essentially no calories. But adding whole milk, whipped cream, chocolate, and sugar or syrup flavorings can turn coffee into a meal's worth of calories or more. In large saucepan or small Dutch oven, heat oil over medium-high heat. Add onion and green pepper, stirring often, until onion is translucent, 5 minutes. Add garlic, stirring occasionally, 3 minutes, . Mix in chili powder and cumin, stirring until fragrant, 1 minute. Add coffee and oregano, stirring to combine with other seasonings. Add tomatoes, broth, beans and sweetener, if using. Stir together and bring chili to gentle simmer. Reduce heat and cook, uncovered for 20 minutes. Season to taste with salt and pepper. May be made up to 3 days ahead. Reheat in heavy pot, covered, over medium heat. Add splash of vegetable broth if chili is too thick. 11 g protein, 11 g dietary fiber, 296 mg sodium. Note: Coffee adds deep flavor to this meatless, mildly hot chili. If possible, use a fine grind or whirl a coarser grind in a coffee grinder until very fine. 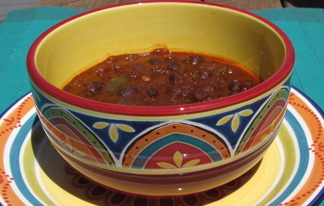 This intense chili is good served over whole-wheat or spelt spaghetti as well as with brown rice, garnished with chopped onions and cilantro. Or serve it in a bowl, topped with a dollop of reduced-fat sour cream. It definitely tastes better the next day. Can I get dehydrated from drinking coffee? Actually, research has established that moderate amounts of coffee, whether regular or decaf, can help keep us well hydrated. Caffeine's small diuretic effect is more than counter-balanced by the fluid we get as we drink coffee. Does coffee contain a lot of potassium? Coffee is not nearly as high in potassium as many other foods. Coffee is one of the top five sources of potassium for U.S. adults because we drink so much of it and we don't eat enough of the foods rich in potassium. Fruits and vegetables are the best sources of potassium, including spinach and other cooked greens, winter squash, white and sweet potatoes, tomato juice and sauce, bananas, citrus fruit, cantaloupe, dried apricots and raisins. Dried beans such as kidney and garbanzos are also very high in potassium. Do some people need to avoid coffee? There are some reasons people may need to avoid or limit coffee. Coffee may worsen the symptoms of GERD (gastroesophageal reflux disease). Health experts recommend that pregnant women limit their total daily caffeine from coffee, soft drinks and other sources to 200 milligrams, or about two 6-ounce cups of regular coffee. People with sleep difficulties need to be careful about the amount and timing of caffeine consumption. American Dietetic Association Evidence Analysis Library, How do caffeinated beverages affect the need for other fluids in adults?, ADA. Accessed August 12, 2011. http://www.adaevidencelibrary.com/evidence.cfm?evidence_summary_id=250554. Goldstein, E., et al. International society of sports nutrition position stand: caffeine and performance. Journal of the International Society of Sports Nutrition, 2010. 7(1): p. 5. Mattila P, Hellstrom J, and Torronen R. Phenolic acids in berries, fruits, and beverages. Journal of Agricultural and Food Chemistry, 2006. 54(19): p. 7193-9. Carlsen M, et al. The total antioxidant content of more than 3100 foods, beverages, spices, herbs and supplements used worldwide. Nutrition Journal, 2010. 9: p. 3. Yu X, et al., Coffee consumption and risk of cancers: a meta-analysis of cohort studies. BMC Cancer, 2011. 11: p. 96. World Cancer Research Fund / American Institute for Cancer Research, Food, Nutrition, Physical Activity and the Prevention of Cancer: a Global Perspective, 2007: Washington, DC. p. 148-156. Zhang X, et al. Risk of colon cancer and coffee, tea, and sugar-sweetened soft drink intake: pooled analysis of prospective cohort studies. Journal of the National Cancer Institute, 2010. 102(11): p. 771-83. Turati F, et al. Coffee and cancers of the upper digestive and respiratory tracts: meta-analyses of observational studies. Annals of Oncology : Official Journal of the European Society for Medical Oncology / ESMO, 2011. 22(3): p. 536-44. Turati F, et al. A meta-analysis of coffee consumption and pancreatic cancer. Annals of oncology : official journal of the European Society for Medical Oncology / ESMO, 2011. Je Y, Liu W, and Giovannucci E. Coffee consumption and risk of colorectal cancer: a systematic review and meta-analysis of prospective cohort studies. International Journal of Cancer. Journal International du Cancer, 2009. 124(7): p. 1662-8. Arab L. Epidemiologic evidence on coffee and cancer. Nutrition and Cancer, 2010. 62(3): p. 271-83. Misik M, et al. 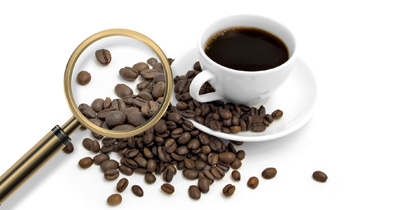 Impact of paper filtered coffee on oxidative DNA-damage: results of a clinical trial. Mutation Research, 2010. 692(1-2): p. 42-8. Bakuradze T, et al. Antioxidant-rich coffee reduces DNA damage, elevates glutathione status and contributes to weight control: results from an intervention study. Molecular Nutrition & Food Research, 2011. 55(5): p. 793-7. Kempf K, et al. Effects of coffee consumption on subclinical inflammation and other risk factors for type 2 diabetes: a clinical trial. The American Journal of Clinical Nutrition, 2010. 91(4): p. 950-7. Kotyczka C, et al. Dark roast coffee is more effective than light roast coffee in reducing body weight, and in restoring red blood cell vitamin E and glutathione concentrations in healthy volunteers. Molecular Nutrition & Food Research, 2011. Morii H, et al. Effects of instant coffee consumption on oxidative DNA damage, DNA repair, and redox system in mouse liver. Journal of Food Science, 2009. 74(6): p. H155-61. van Dam RM. Coffee consumption and risk of type 2 diabetes, cardiovascular diseases, and cancer. Applied Physiology, Nutrition, and Metabolism. Physiologie Appliquee, Nutrition et Metabolisme, 2008. 33(6): p. 1269-83. Fujise Y, Okano J, Nagahara T, Abe R, Imamoto R, Murawaki Y. Preventive effect of caffeine and curcumin on hepato-carcinogenesis in diethylnitrosamine-induced rats. International Journal of Oncology. 2012 Jun;40(6):1779-88. Kang NJ, Lee KW, Kim BH, Bode AM, Lee HJ, Heo YS, Boardman L, Limburg P, Lee HJ, Dong Z. Coffee phenolic phytochemicals suppress colon cancer metastasis by targeting MEK and TOPK. Carcinogenesis. 2011 Jun;32(6):921-8. Epub 2011 Feb 11. Wilson, KM., et al. Coffee Consumption and Prostate Cancer Risk and Progression in the Health Professionals Follow-up Study. Journal of the National Cancer Institute, June 8, 2011 (Advance Online Access May 17, 2011). Volume 103, Issue 11, pp. 1-9. Freedman ND, Park Y, Abnet CC, Hollenbeck AR, Sinha R. Association of coffee drinking with total and cause-specific mortality. New England Journal of Medicine. 2012 May 17;366(20):1891-904. Floegel A, Pischon T, Bergmann MM, Teucher B, Kaaks R, Boeing H. Coffee consumption and risk of chronic disease in the European Prospective Investigation into Cancer and Nutrition (EPIC)-Germany study. American Journal of Clinical Nutrition. 2012 Apr;95(4):901-8. Epub 2012 Feb 15. Giri A, Sturgeon SR, Luisi N, Bertone-Johnson E, Balasubramanian R, Reeves KW. Caffeinated coffee, decaffeinated coffee and endometrial cancer risk: a prospective cohort study among US postmenopausal women. Nutrients. 2011 Nov;3(11):937-50. Epub 2011 Nov 2. Braem MG, Onland-Moret NC, Schouten LJ, Tjønneland A, Hansen L, Dahm CC, Overvad K, Lukanova A, Dossus L, Floegel A, Boeing H, Clavel-Chapelon F, Chabbert-Buffet N, Fagherazzi G, Trichopoulou A, Benetou V, Goufa I, Pala V, Galasso R, Mattiello A, Sacerdote C, Palli D, Tumino R, Gram IT, Lund E, Gavrilyuk O, Sánchez MJ, Quirós R, Gonzales CA, Dorronsoro M, Castaño JM, Gurrea AB, Idahl A, Ohlson N, Lundin E, Jirstrom K, Wirfalt E, Allen NE, Tsilidis KK, Kaw KT, Bueno-de-Mesquita HB, Dik VK, Rinaldi S, Fedirko V, Norat T, Riboli E, Kaaks R, Peeters PH. Coffee and tea consumption and the risk of ovarian cancer: a prospective cohort study and updated meta-analysis. American Journal of Clinical Nutrition. 2012 May;95(5):1172-81. Epub 2012 Mar 21. Genkinger JM, Li R, Spiegelman D, Anderson KE, Albanes D, Bergkvist L, Bernstein L, Black A, van den Brandt PA, English DR, Freudenheim JL, Fuchs CS, Giles GG, Giovannucci E, Goldbohm RA, Horn-Ross PL, Jacobs EJ, Koushik A, Männistö S, Marshall JR, Miller AB, Patel AV, Robien K, Rohan TE, Schairer C, Stolzenberg-Solomon R, Wolk A, Ziegler RG, Smith-Warner SA. Coffee, tea, and sugar-sweetened carbonated soft drink intake and pancreatic cancer risk: a pooled analysis of 14 cohort studies. Cancer Epidemiology, Biomarkers and Prevention. 2012 Feb;21(2):305-18. Epub 2011 Dec 22.